Alabama’s federal income tax (FIT) deduction provides a huge tax break for high-income individuals – but at what cost? $719 million to be exact. The FIT deduction is one big reason Alabama’s tax system is upside down. For those who earn $30,000 a year, the deduction saves them about $27 on average. But for the top 1% of taxpayers, the FIT break is worth an average of more than $11,000. The higher the income, the more the FIT deduction is worth for those who can most afford to pay more to fund education, health care and other vital needs. Only two other states offer a full FIT deduction like Alabama does. (Three other states offer a partial deduction.) Ending the FIT deduction would bring in an additional $719 million a year, the Institute on Taxation and Economic Policy estimates. That would be enough to allow Alabama to remove the state sales tax on groceries and expand Medicaid. Our state also could use that money to ensure full funding for the Children’s Health Insurance Program (CHIP) in 2021 and make critical investments in education and other areas. Alabama’s constitution dedicates income tax revenue to education, and the FIT deduction is written into the document as well. So this plan would require the Legislature and the public to approve a constitutional amendment. 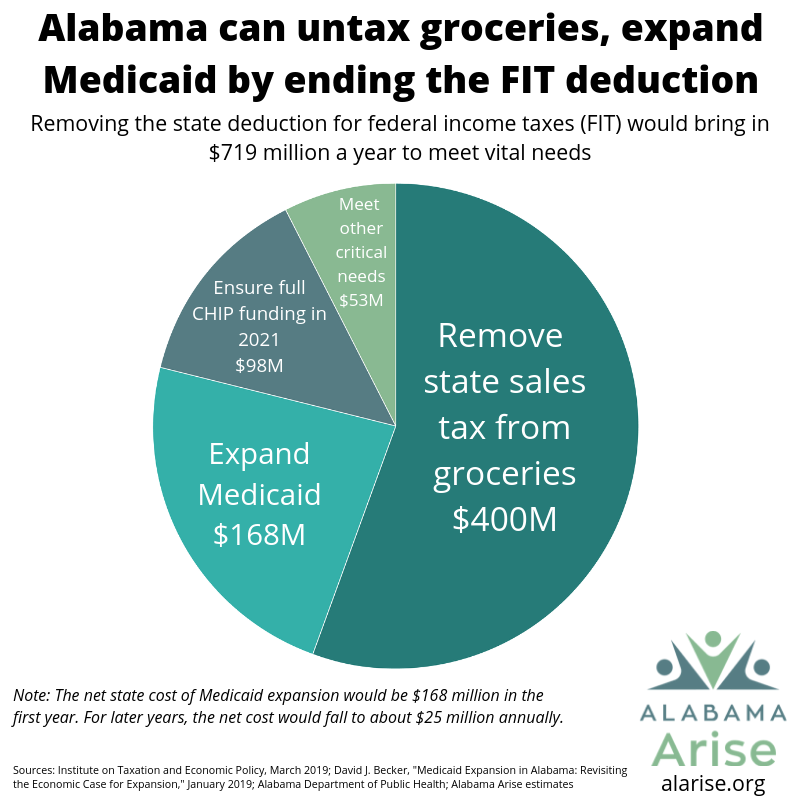 But ending the FIT deduction would be a good way for Alabama to begin prioritizing public investments that benefit everyone over tax breaks that primarily benefit a select few.